New York City has a long list of exceptional restaurants, though none are serving up anything quite like what you will find at La Chine. 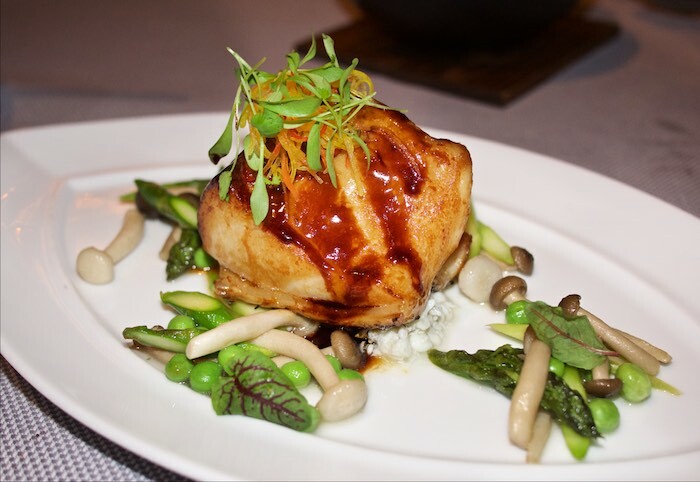 The new upscale Chinese restaurant, located inside the famed Waldorf Astoria, is offering a creative spin on traditional Chinese cuisine. 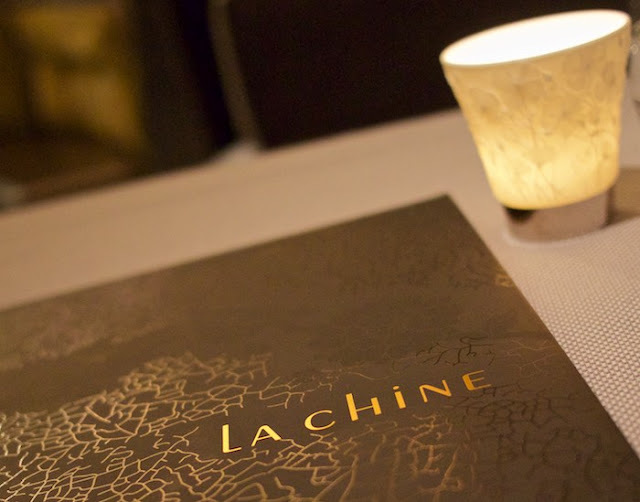 Each dish on La Chine's menu transports diners on a culinary journey through the various regions of the country. The dazzling chandelier, the black lacquered panels, used to create semi-private dining areas and the hand painted cherry blossom walls brings the ambiance of a classic Chinese restaurant to life in the main dining room. 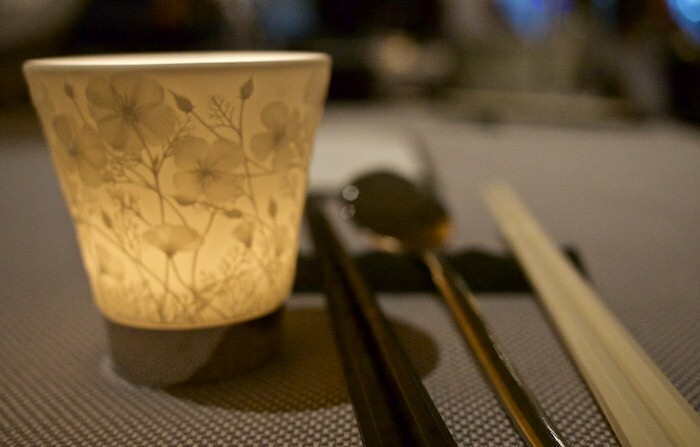 While elegant finishes such as fine linens, glowing candles and chopsticks are evident at each table. Asian inspired cocktails are uniquely crafted featuring things like green tea shochu, szechuan pepper and sesame infused bourbon. For those not into cocktails there are a lot of nice wine choices and a comprehensive sake menu. 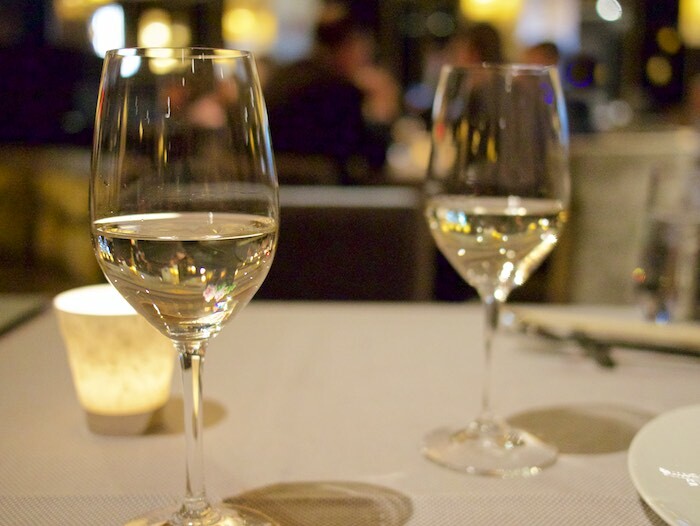 Waiters are extremely knowledgeable and willing to offer pairing suggestions with each course. The menu is divided into the following sections: raw bar, appetizers, sides to share, soup, BBQ, seafood, beef/lamb/chicken, and rice/noodles. Chef tasting menus are available and though I decided to order a la carte the tasting menu is a good way to get a comprehensive sample of all La Chine has to offer. We started our meal with one of the raw bar options. 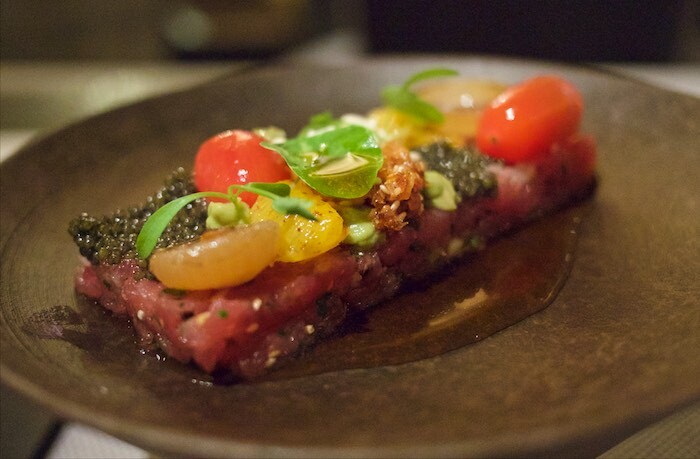 The tuna tartare, was a tasty combination of tuna, caviar, and a mosaic of pickled vegetables drizzled with a soy vinegar. The pearls of caviar added just enough flavor to make this a delicious and delicate way to begin our dining experience. We followed this with thin slices of pork belly, served with a sriracha chili dipping sauce. Each bite of the tender belly offered a hint of sweet finished with a kick of spice, that can only be described as decadent. The barbecue duck is a house specialty, that must not be missed. 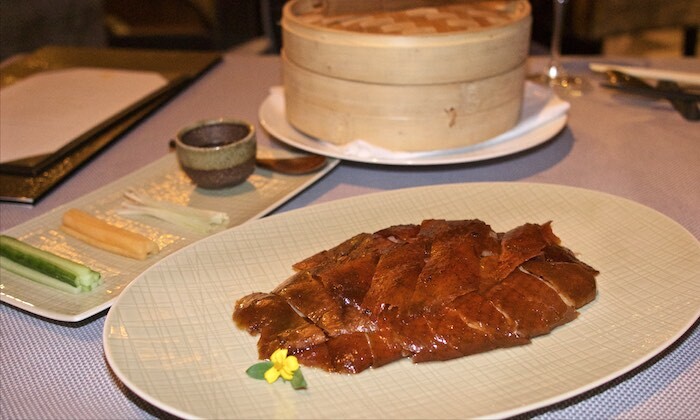 Diners have the option of ordering a whole or half duck which is served with a thick hoisin sauce, matchstick condiments of cucumber, leek, and steamed paper thin crepes. Served under crispy skin, the dark flavorful meat just melts in your mouth. From here we moved on to the Sea Bass glazed with Waldorf rooftop honey and soy. The fish was delicious on its on but the pure honey & soy glaze took it over the top. 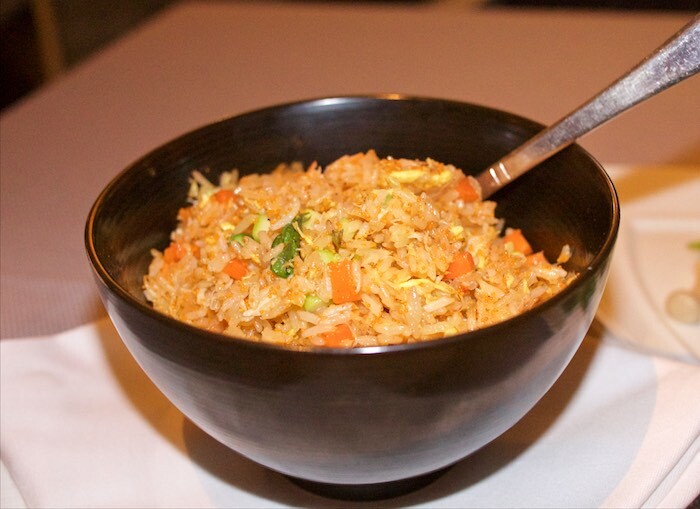 Though you may think Jasmine rice is boring nothing is further from the truth at La Chine. The fragrant fried rice that we ordered was mixed with crab meat and fish roe giving it layers of flavor. It was so good that even though I was full I found myself still reaching for more. Like everything else we tasted, dessert at La Chine did not disappoint. 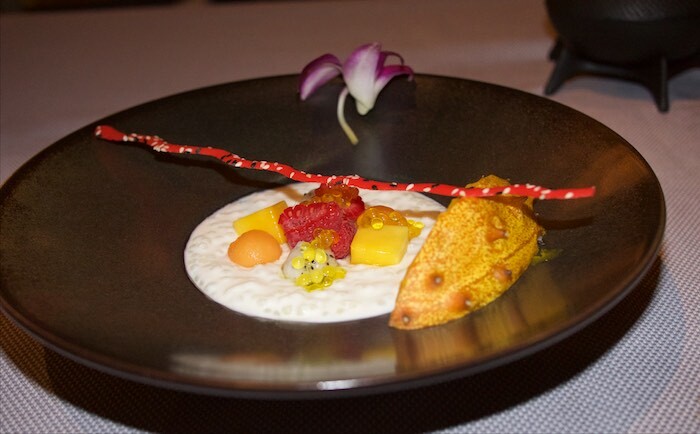 We had the coconut tapioca soup which came with dragon fruit, mango and horned melon. Light and fresh the dessert was a delicious way to end this wonderful dining experience. If you find yourself in NY, looking for something a little different and delicious, I would recommend a dinner at La Chine. Nice recap of your experience. OMG - all those pictures are making my mouth water! What a great post. I'm dying to visit, now! All that food looks amazing! I would love to try out that bbq duck! What a fantastic sounding experience, and oh my gosh, that pork belly! It all looks amazing. What a gorgeous restaurant! I have my eye on the duck...and the pork belly! Everything looks amazing, but that pork belly and duck are just calling to me! I'm also loving the pork belly! Must check out next trip in NYC! So fancy! I'm jealous that you are able to eat at all these places! Wow, looks like a lovely place! so, super classy!! Love that pork belly!